A prison official checks documents before a group of regular prisoners are freed from Insein prison in Yangon, April 8, 2016. Burmese language media said Friday Myanmar has released 69 student activists who were detained last year and awaiting trial. Myanmar has begun releasing a number of political prisoners, as promised by ruling party leader Aung San Suu Kyi on Thursday. Families have been gathering at Myanmar's prisons since Aung San Suu Kyi's announcement. They are awaiting word of their loved ones, or perhaps even a reunion as the prisoners are freed. Aung San Suu Kyi has promised to push for the release of political prisoners and student activists in the Southeast Asian country. She said amnesties would be granted as part of the celebration of the Buddhist new year, which occurs mid-April. Newly-released political student protesters and family members shout and cheer after their release in Tharrawaddy town, Bago Region in Myanmar on April 8, 2016. Lawmakers voted to establish the position of state counselor this week, a move that makes Aung San Suu Kyi the country's de facto top leader despite a prohibition on her serving as president of Myanmar, also known as Burma. 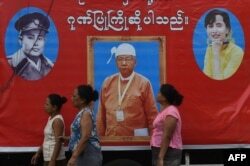 Relatives and sympathisers of political prisoners wait outside Insein prison in Yangon on April 8, 2016 in front of a banner bearing the portrait of new Myanmar President Htin Kyaw (C) democracy icon Aung San Suu Kyi (R) and the late Myanmar hero General Aung San (L), the father of Aung San Suu Kyi. Included in the new government in Myanmar sworn in last week are many democratic activists who spent years in jail under the former military-ruled government. Aung San Suu Kyi herself spent most of 15 years under house arrest. Her National League of Democracy party came to power following a landslide November election that ushered in the country's first civilian-led government in more than five decades. But the military still remains a political force, holding 25 percent of all parliamentary seats. The democracy leader, who stated during the election campaign that she would hold a position “above the president” is also foreign minister and minister of the President's Office. Because her children are foreign nationals, Aung San Suu Kyi is constitutionally barred from being president. Her childhood friend Htin Kyaw holds that position.